"God Bless Our Homeland Ghana" is now the national anthem of Ghana, since mid 1966. The music of the Ghanaian anthem was first adopted on 1957 and the lyrics were changed 1966, with the overthrow of the first elected president of the Republic of Ghana; Dr Kwame Nkrumah, Feb 1966. And under God march on forevermore. The original words of the Ghanaian national anthem were adopted upon the independence of the country in 1957. The master copy of Ghana's national anthem was composed by Philip Gbeho in 1957. The cause of Freedom and of Right. Only the added part of the anthem is sung, the other 2 parts have changed position, and left away, when singing! Due this change, many young Ghanaians don`t even know their anthem. Unfortunately. I promise on my honour to be faithful and loyal to Ghana my motherland. I pledge myself to the service of Ghana with all my strength and with all my heart. I pledge myself in all things to uphold and defend the good name of Ghana. 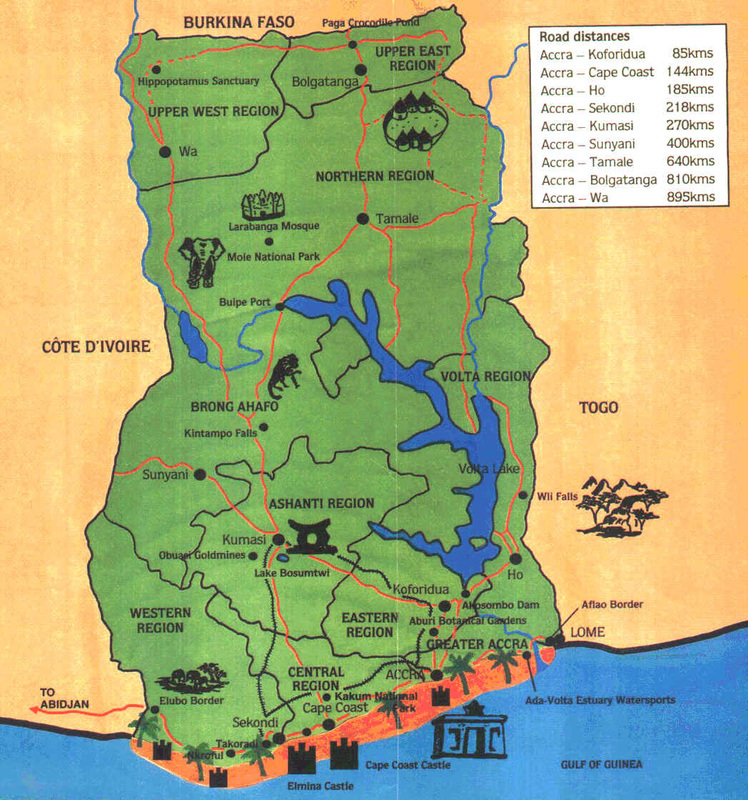 Ghana Map - Click to enlarge! Oman no se 'beye yie O Oman no se erenye yie O!